…this is a hugely impressive volume and arguably the jewel in the crown of Doyen’s five Gregson collections to date. With the composer having returned to writing for brass band with two of his finest works, we can only hope that there will be the necessity for further volumes to come. 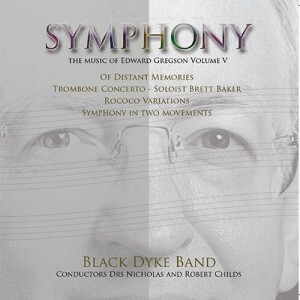 The transcription from the orchestral accompaniment of the 1979 Trombone Concerto is highly successful and the solo part is masterfully performed by Brett Baker…Black Dyke is in superb form, a highly distinguished sound quality, impeccable ensemble, outstanding soloists, and well argued musical direction..If it were only for the important Symphony in two movements alone, this is a recording that should be on the top of every music lover’s Christmas list.